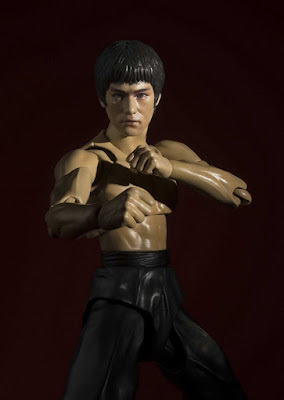 Anaheim, CA – Bluefin, the leading North American distributor of toys, collectibles, and hobby merchandise from Japan, Hong Kong and more, is proud to introduce the world’s most posable Bruce Lee action figure! Renowned Japanese collectibles label, Tamashii Nations, integrates its advanced S.H. Figuarts articulation technology to reproduce all of Bruce Lee's powerful martial arts moves! For this latest release, Tamashii Nations also utilized cutting edge digital facial coloring technology to achieve a stunning level of realism and collectors will be impressed by the incredible level of overall quality. The Bruce Lee figure debuts in February 2016 with an MSRP of $49.99 from authorized Bluefin retailers nationwide and also from a variety of leading online outlets. Pre-orders continue to be available. The S.H. Figuarts Bruce Lee figure stands 5 inches tall and includes several trademark martial arts weapons including a nunchaku (nunchuck) and two bo staffs (short and long. Other accessories include interchangeable hands (x9) and interchangeable face parts (x2). Bruce Lee was a pioneering Chinese American action film star, martial arts instructor, philosopher, and filmmaker. He starred in several highly influential martial arts movies such as Fist of Fury and Enter the Dragon and is widely regarded as one of the most iconic martial artists of all time. Bluefin is the official North American distributor for Tamashii Nations, an umbrella label that encompasses Japan’s top collectible brands and features products from popular giant robot shows like Mazinger Z and Gundam, anime series like Dragon Ball and Sailor Moon, and live action series like Kamen Rider. The mission of Tamashii Nations is to bring “tamashii,” the Japanese word for soul or spirit, into everything they create. For a complete listing of Tamashii Nations products available from Bluefin, please visit: www.bluefincorp.com/catalog/tamashii-nations.html. Based in Irvine, CA, Bluefin built its reputation as a leading distributor of Japanese toys, collectibles, novelty and hobby products. In recent years, Bluefin has grown to include a range of high quality collectible lines from the United States, Hong Kong, Taiwan and Singapore and established itself as the official North American consumer products and retail development partner for Studio Ghibli. Selling to thousands of specialty, chain and independent stores, Bluefin is an official North American distributor for Bandai Hobby, Kotobukiya and Capcom, is the sole provider of Bandai Tamashii Nations products, and is also the exclusive and official distributor for Hero Cross, Beast Kingdom, Comicave, Mr. Hobby, SEN-TI-NEL and X-Plus. Bluefin also represents TruForce Collectibles products worldwide. Additional information is available at: www.bluefincorp.com.